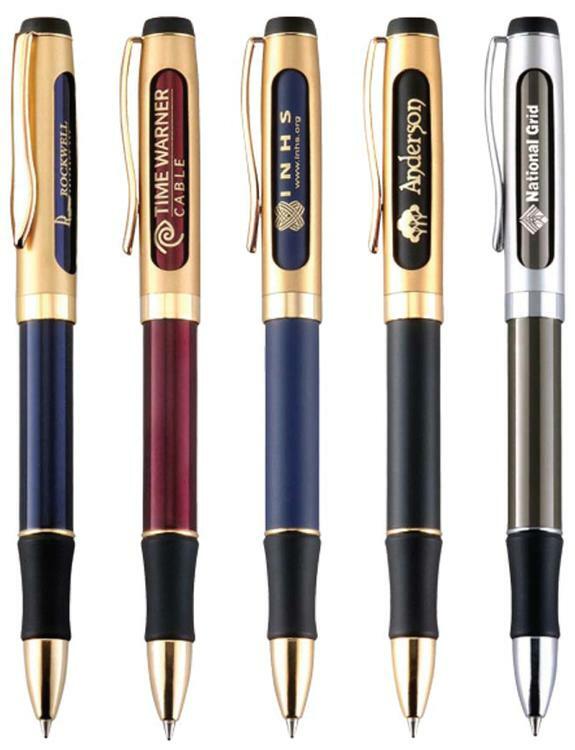 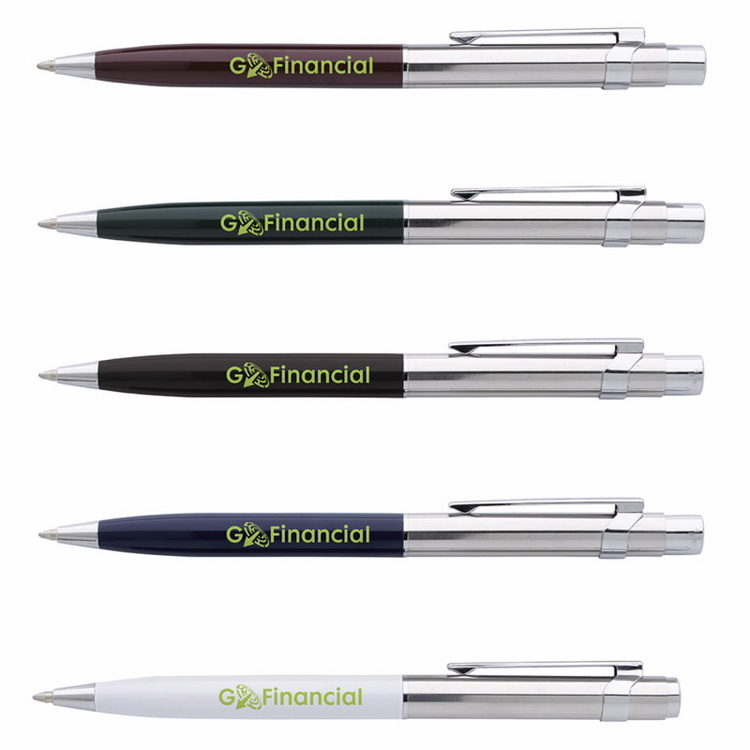 Wall Street Style Pen Two Silver Bands Black Click and Base Ballpoint Ink Refill Pen Colors: Black, Blue, Charcoal, Gold, Silver Ink Refill Color: Black Ink Includes a One Color, One Location Imprint or Laser Engraving Imprint Area: 1.75" W x 0.44" H Additional Imprint Color: Add $0.55 (v) plus Setup Charge Additional Imprint Location: Add $0.55 (v) plus Setup Charge Production Time: 7-10 Working Days from Proof Approval FOB: FL 33125 500 pcs / 24 lbs 18" x 15" x 9"
Aluminum click ballpoint pen. 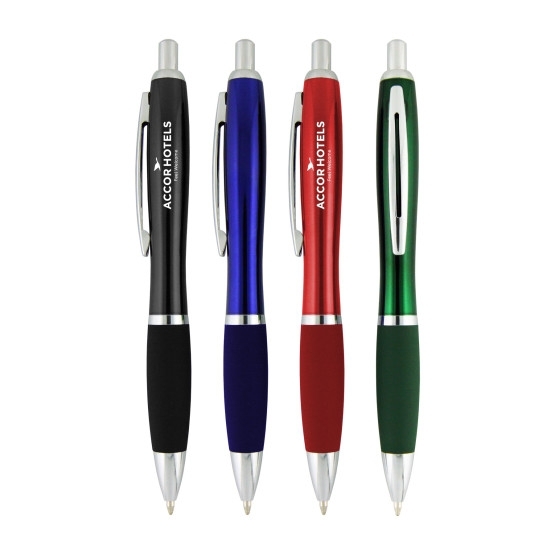 Comes in black, blue, green, red and satin. 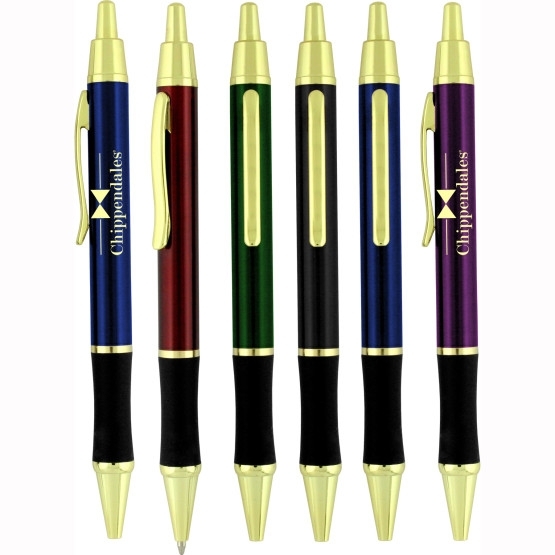 Cap-off ballpoint, metallic cap with PDA stylus. 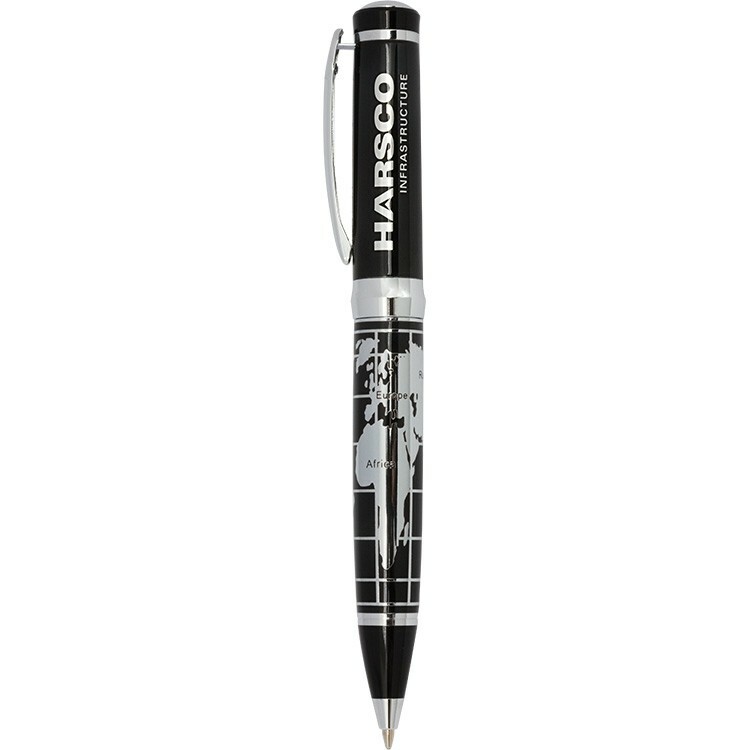 Chrome plated barrel with plunger activated white LED. 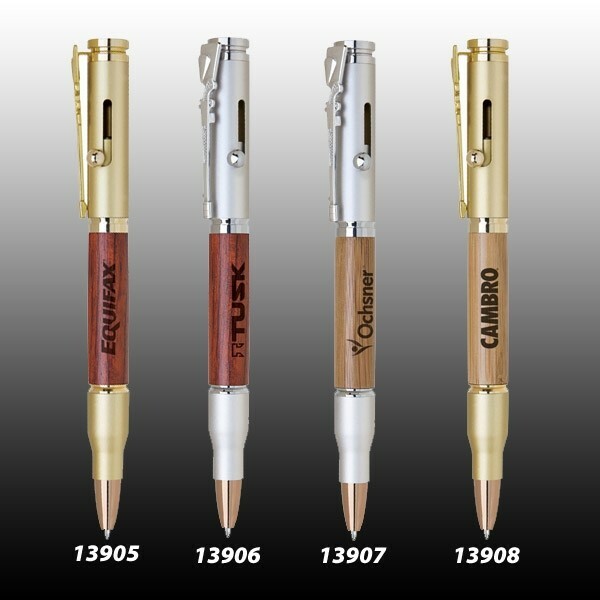 Laser Engraves as Gold. 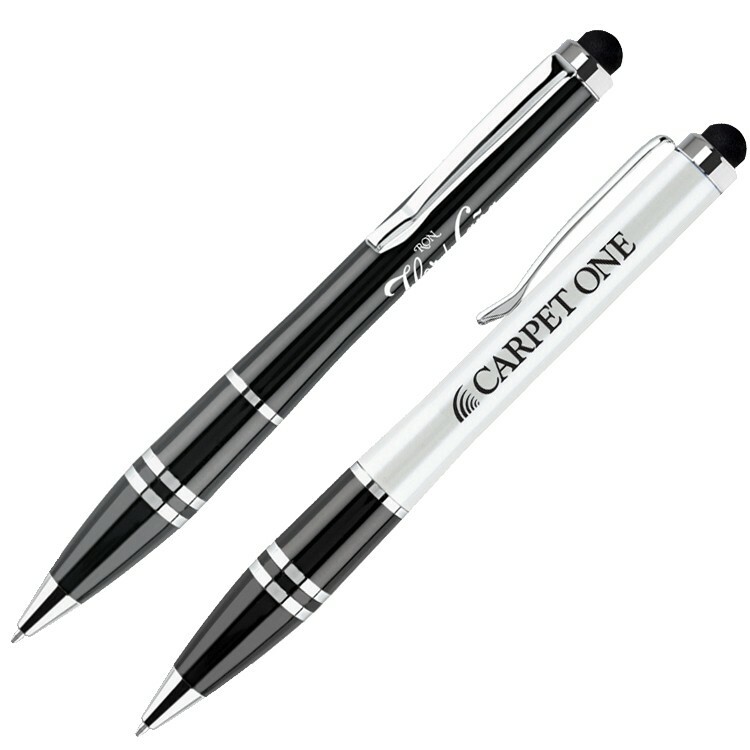 For a silver engraved appearance, Chrome Etch is available at a cost of $0.40(v) per piece. 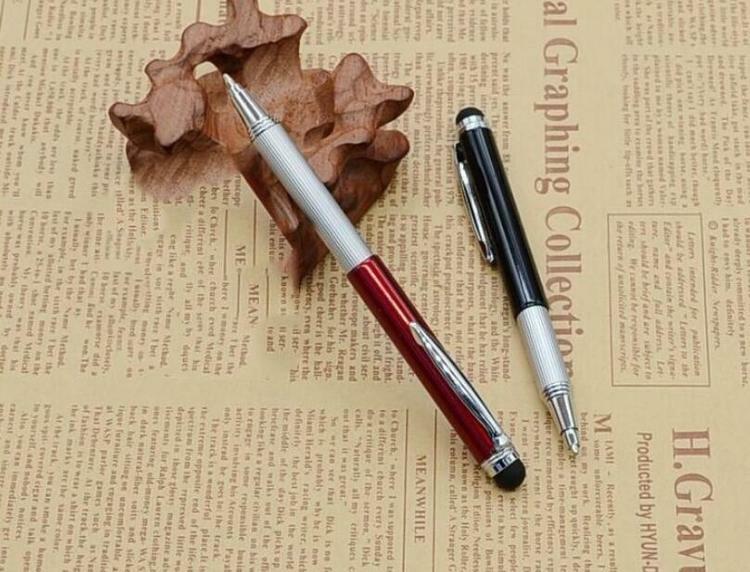 The "Zen" appeal of this bamboo ballpoint, paired with lustrous trimmings, never looked quite so becoming. 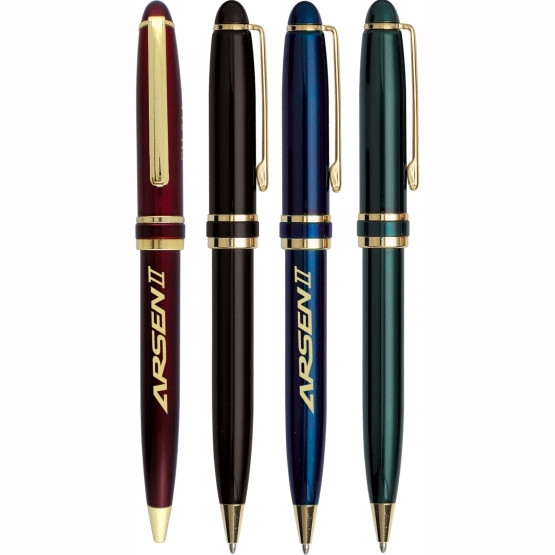 The bamboo material is eco-friendly and can be laser engraved for a crisp, permanent impression. 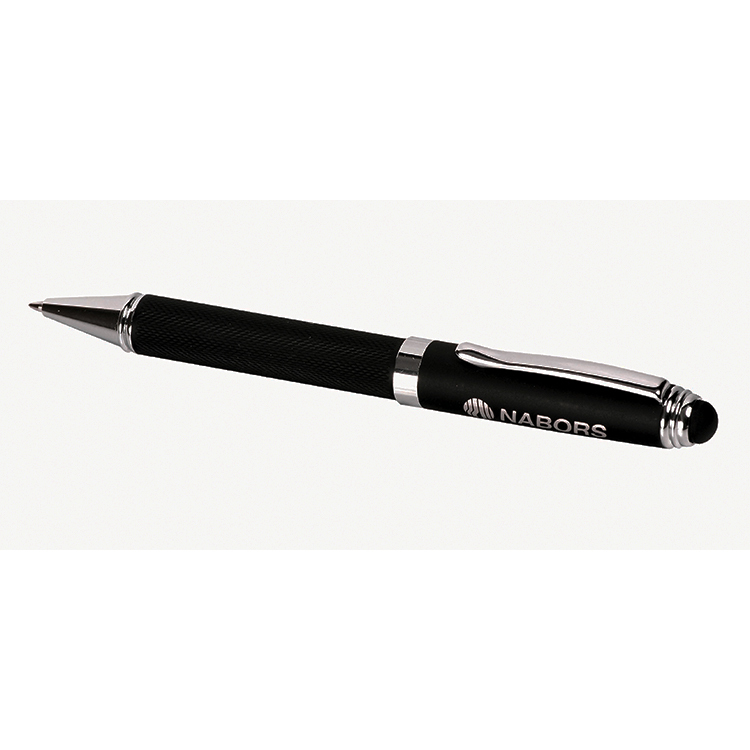 This worldly brass pen features a chrome world map with glossy black accents. 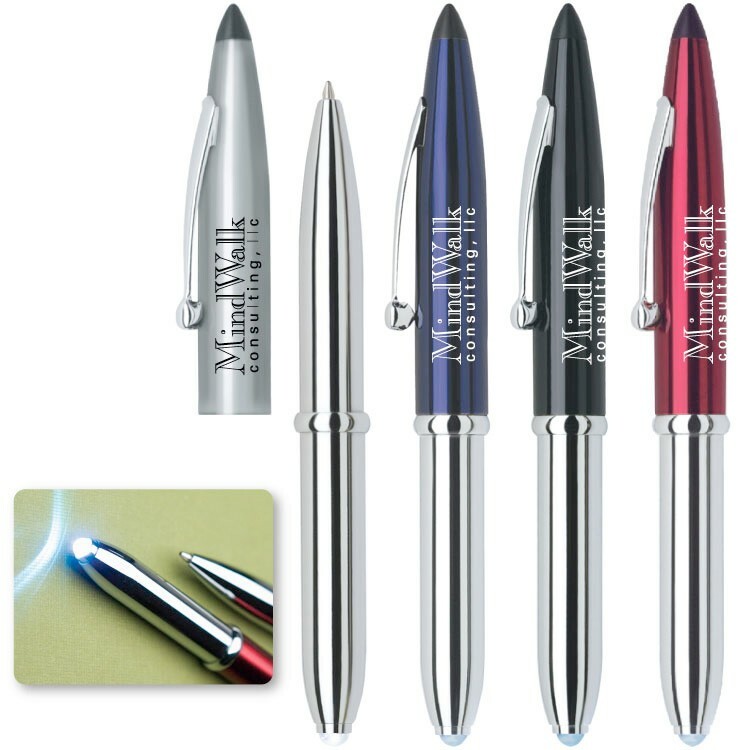 Your logo is laser engraved below the cap and then polished to show off the chrome finish. 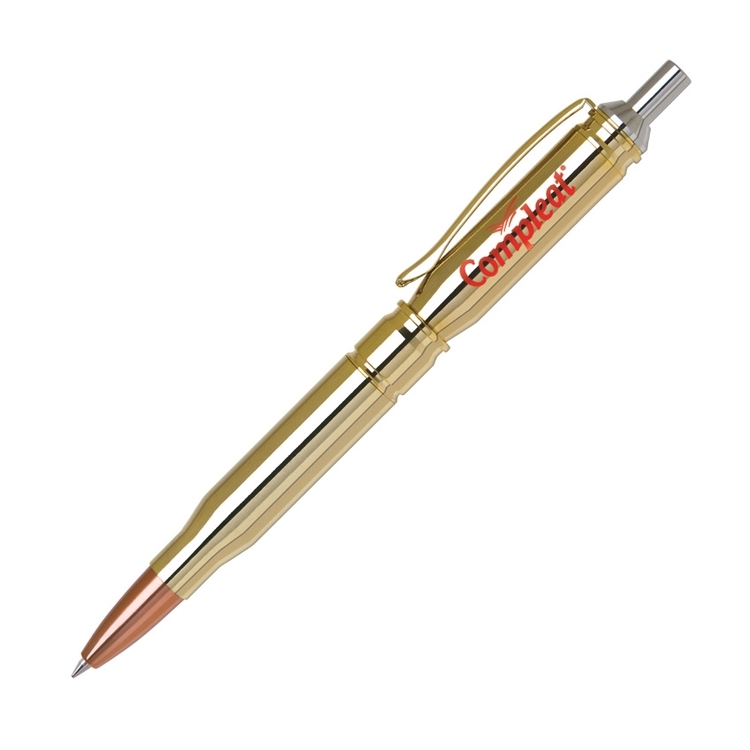 Bullet Brass Ball Pen, Brass bolt action pen with rifle style clip and bullet style tip. 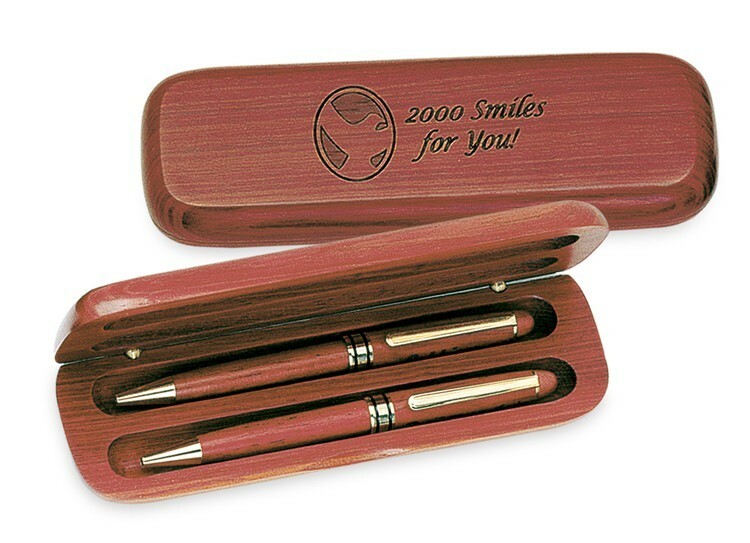 Rosewood middle barrel with gold plated metal findings. 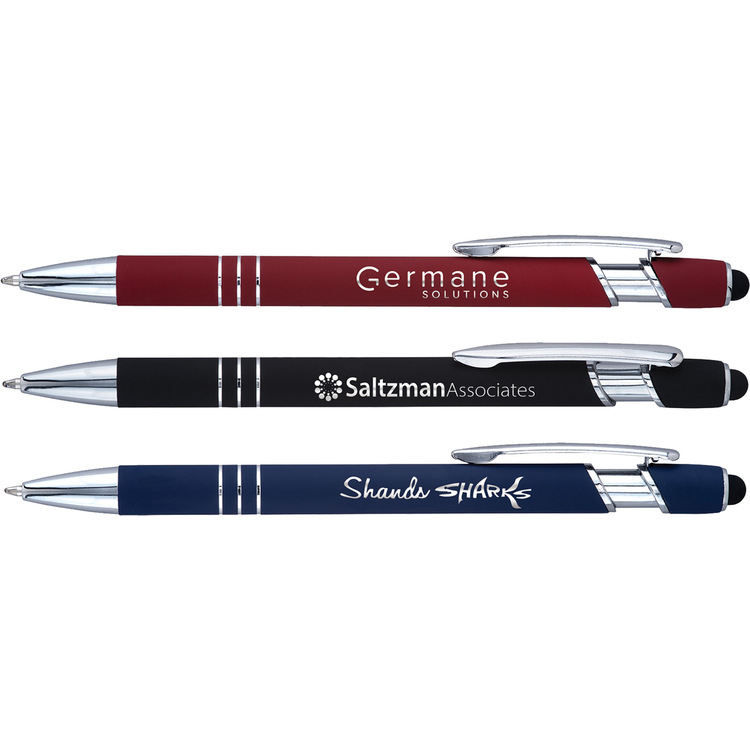 Black Oxidation is available @ $0.50(g) each. 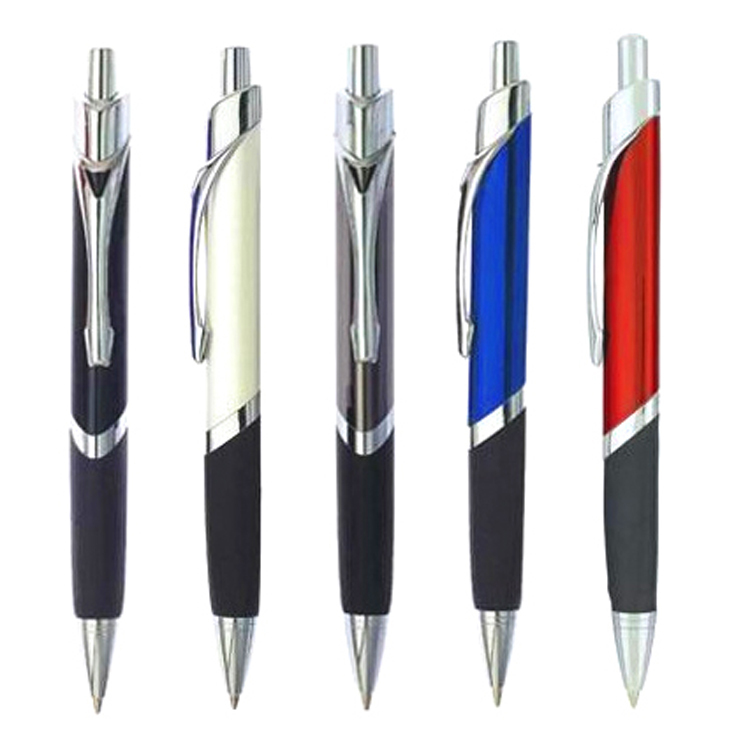 Ballpoint pen is made of metal with styluses. 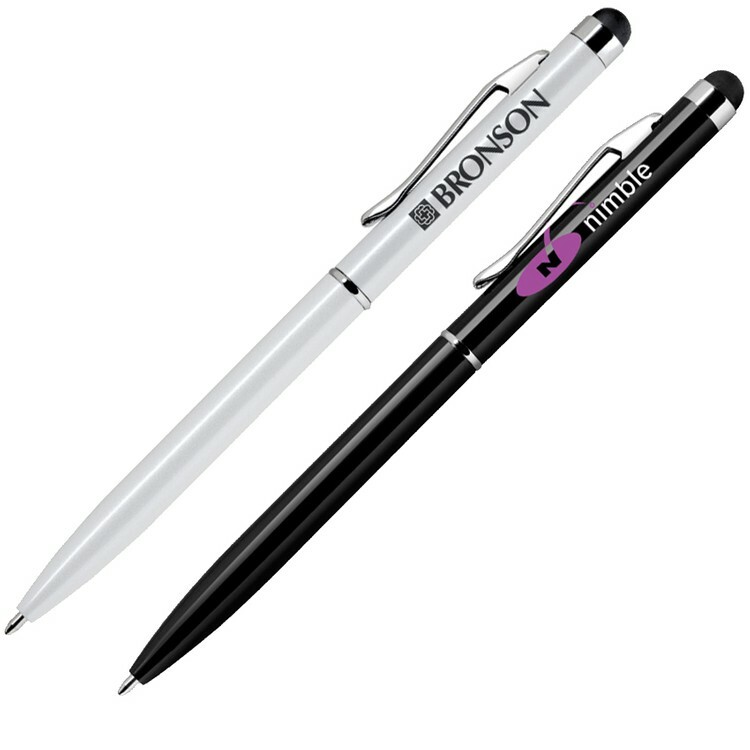 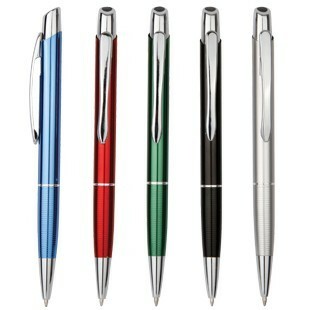 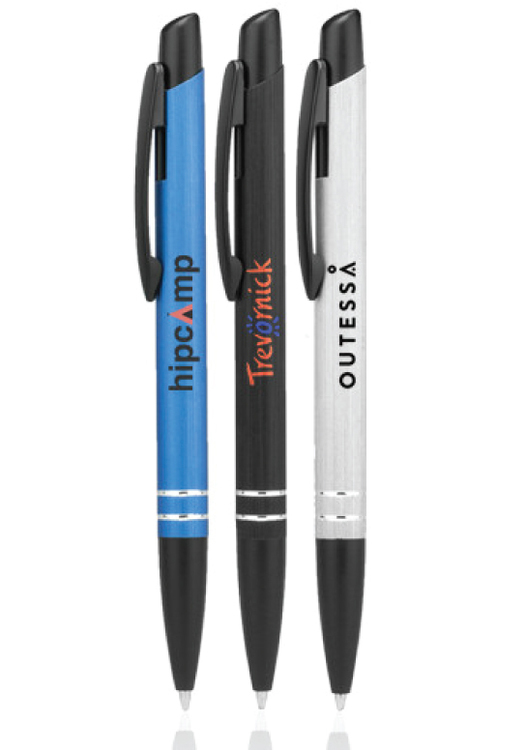 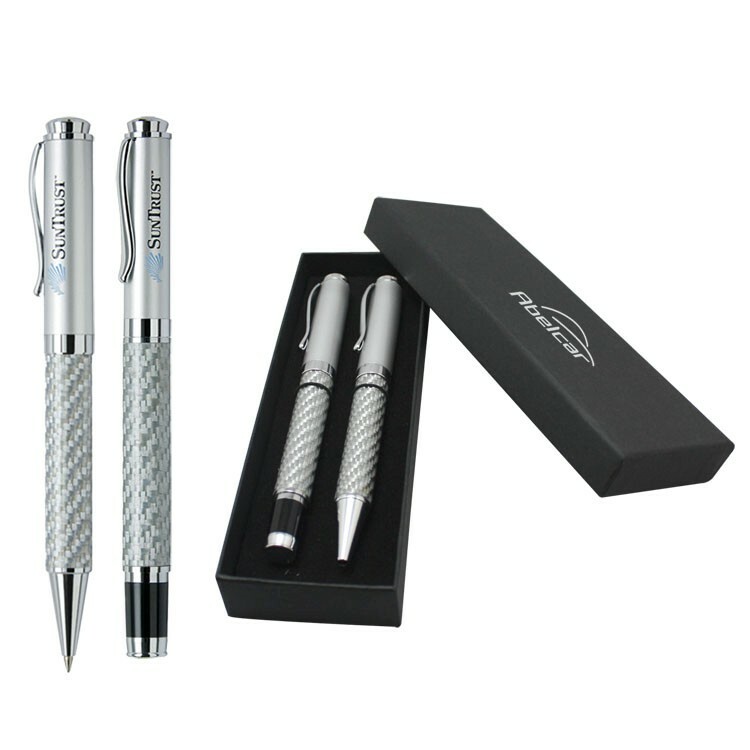 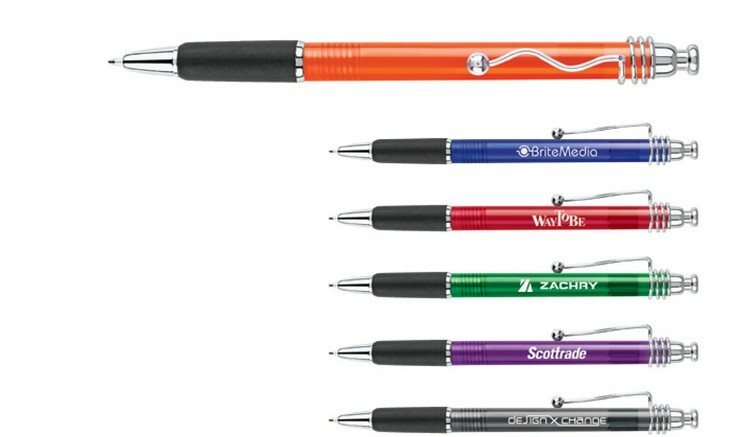 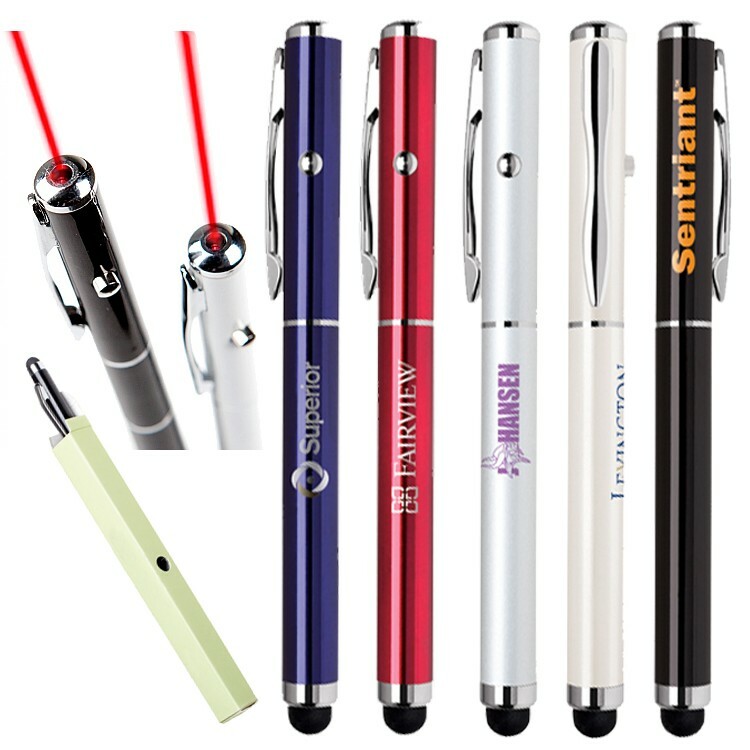 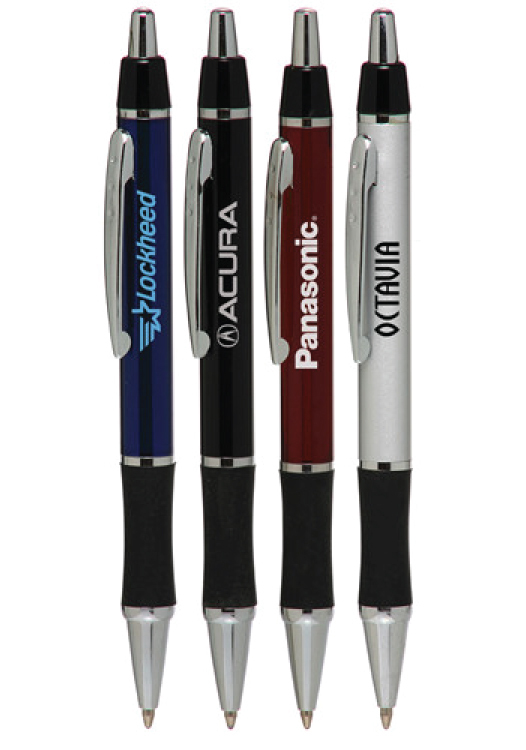 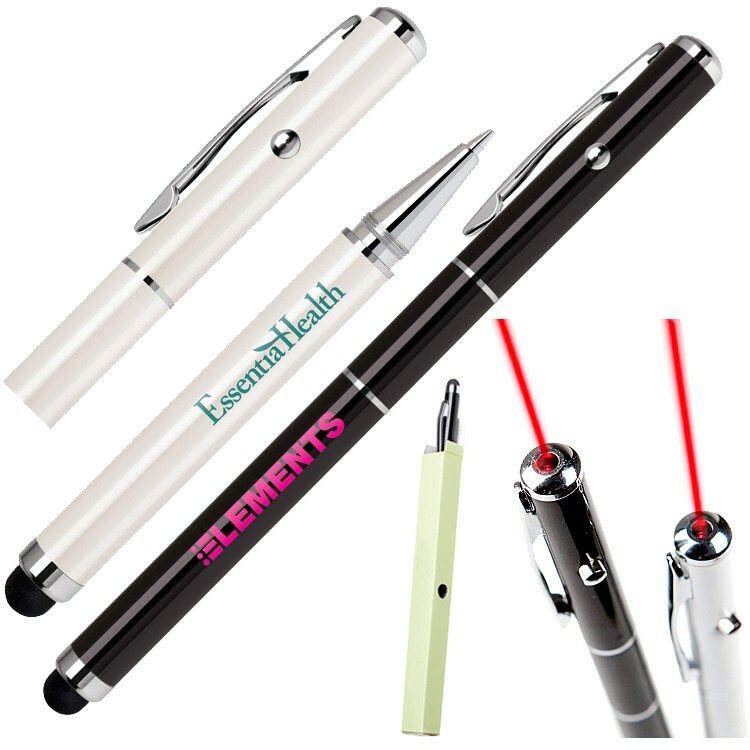 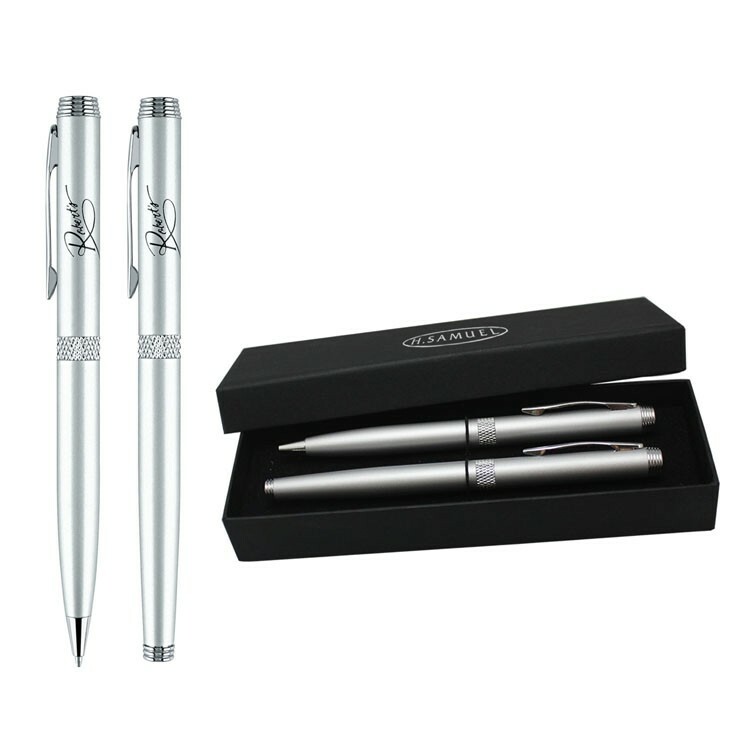 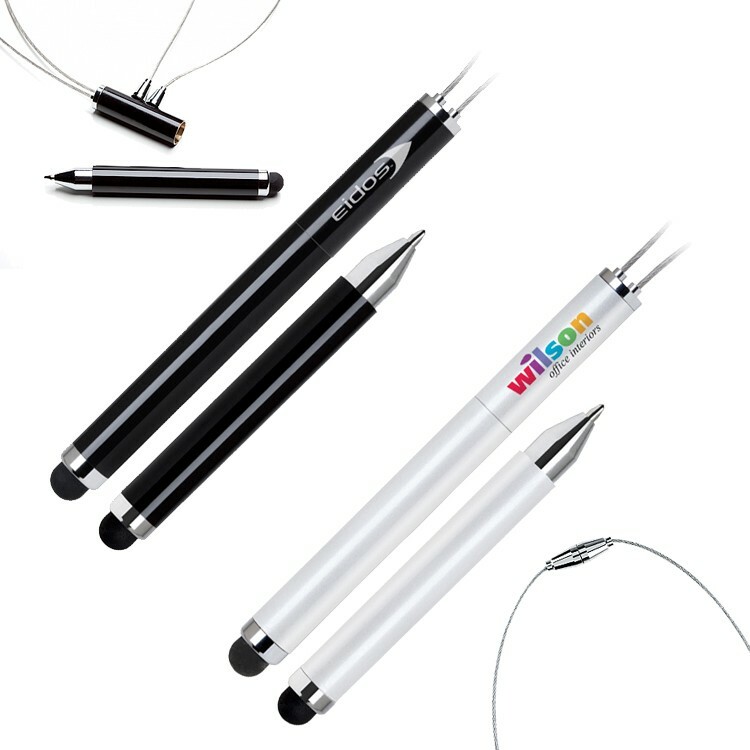 This stylus pen smoothly extends to 5" in length and can be compacted to under 4" in length. 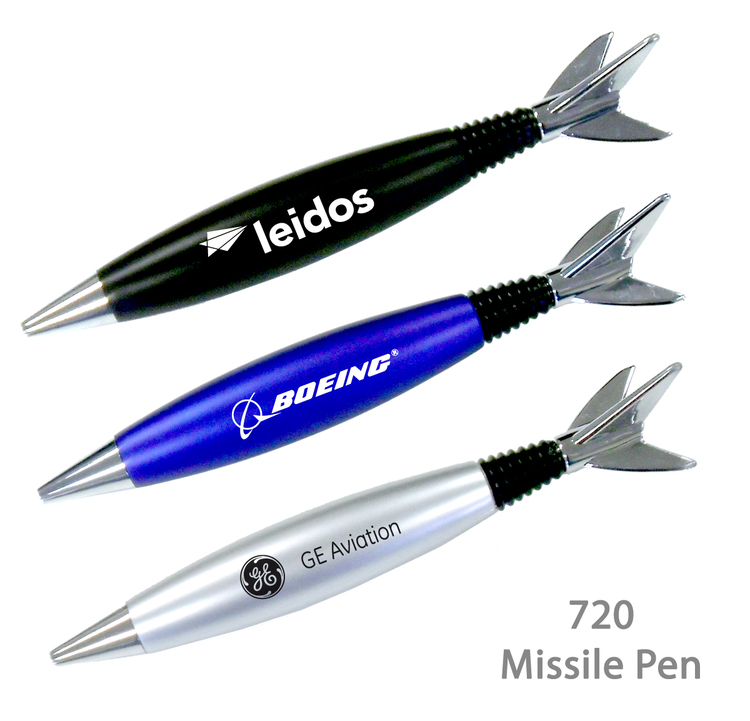 Custom logo can be laser engraved.